There was quite a bit of a scare in San Gimignano Tuesday afternoon (April 3rd) as an 8 meter section of the old city walls, dating back to the Middle Ages, collapsed about 6 meters down the side of the hill. The entire town of San Gimiginano is one of many UNESCO World Heritage Sites in Tuscany. The section along the Eastern side of the town abruptly collapsed, and while there was no warning sign, the walk-able path that circles along the walls had been closed to foot traffic due to recent weather conditions. Firemen, the city mayor Giacomo Bassi and other staff from the city’s technical staff reached the area soon after being alerted to the collapse. Thankfully no people were hurt but a canine team was called to ensure this was the case. The cause of the collapse is still unknown. 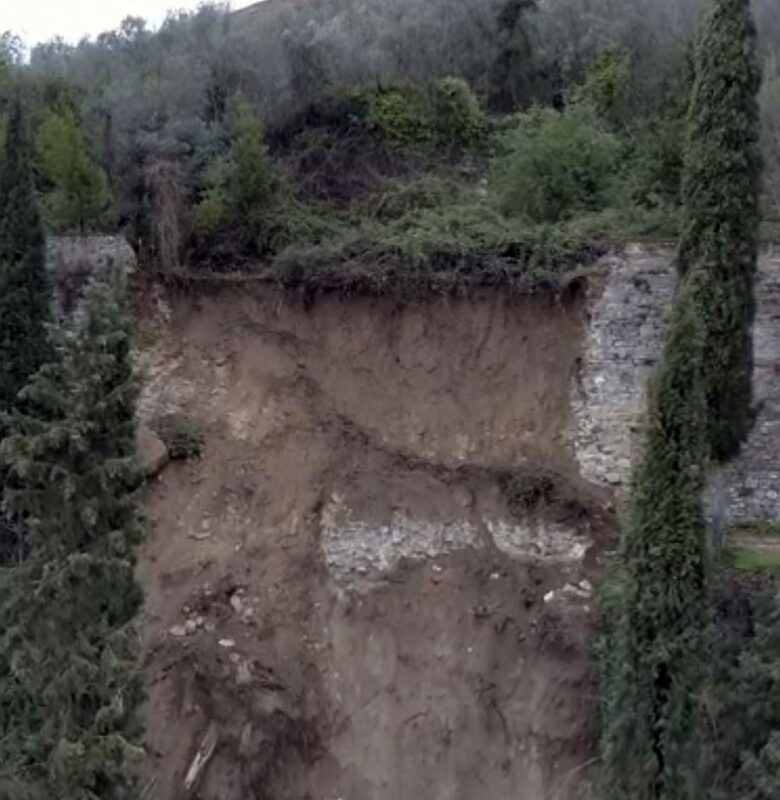 The most likely cause being considered at the moment is that simply the steady rains of the past weeks could have led to weakening the ground both underneath and the side of the hill which lead to the final collapse. The city mayor and local firemen are calling for a State wide program to invest in constant maintenance of UNESCO sites across Italy. The mayor of San Gimignano wants the walls to be restored as soon as possible and thus knows he cannot rely solely on public funds. With the support of the city, the City Councilwoman to Culture Carolina Taddei announced the crowdfunding project #pietradopopietra. This gives the opportunity to ANYONE, private individuals and corporations included, to give a donation to the work of restoration. If you want to contribute, the bank account – which is solely for the restoration of these collapsed walls – to which you can contribute is: IBAN IT13X0103072000000000722568. The account should be operational from next Monday, April 16.